Python, Visual Studio, and C#… So. Sweet. Let’s clear the air. Using Python and C# together isn’t anything new. If you’ve used one of these languages and at least heard of the other, then you’ve probably heard of IronPython. IronPython lets you use both C# and Python together. Pretty legit. If you haven’t tried it out yet, hopefully your brain is starting to whir and fizzle thinking about the possibilities. My development experience is primarily in C# and before that it was VB .NET (So I’m pretty attached to the whole .NET framework… We’re basically best friends at this point). However, pretty early in my career (my first co-op at Engenuity Corporation, really) I was introduced to Python. I had never really used a dynamic or implicitly typed language, so it was quite an adventure and learning experience. Unfortunately, aside from my time at EngCorp, I hadn’t really had a use to continue on with Python development. Lately, I’ve had a spark of curiosity. I’m comfortable with C#, sure, but is that enough? There’s lots of great programming languages out there! It’s hard for me to break out of my comfort zone though. I’m used to C# and the awesomeness of Visual Studio, so how could I ever break free from these two things? Well… I don’t have to yet. But I didn’t really know what it was all about. I had heard of IronPython, and I knew I could use Python with C# together, so what exactly is “Python Tools“? Go to the “Tools” menu at the top of the IDE. Select the “Extensions and Updates…” menu item. You should see the “Extensions and Updates” dialog window now. 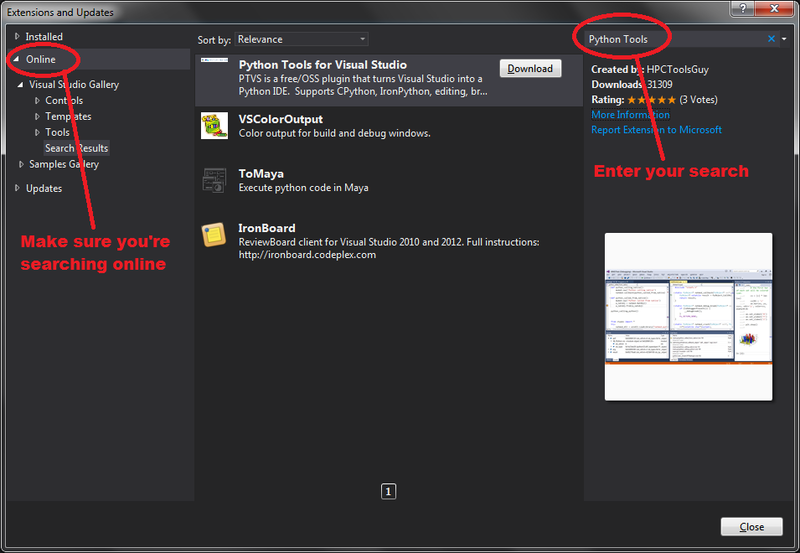 Installing Python Tools for Visual Studio is pretty easy. Make sure you’re searching online and search for “Python Tools”. After you’ve followed all of the installation instructions, it’s time to make sure the installation worked. Simple enough! Go to the “File” menu at the top of the IDE. Go to the “New” menu item. Select the “Project…” menu item. 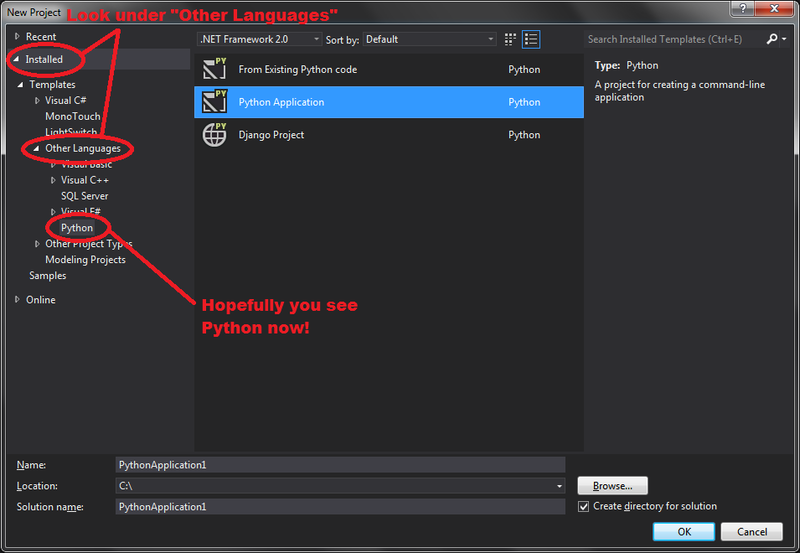 To verify that Python is now available in Visual Studio, check under the installed templates. It should be under “Other Languages”. Hopefully it’s there. If not, or if you have any other install questions, I highly recommend you refer to the official site and follow along there. This is what got me up and running with my current machine, but if your setup is slightly different, you should definitely follow their instructions. That’s it! You have Python Tools! But what else would make your C#, Python, and Visual Studio experience EVEN BETTER? The answer to that question is of course IronPython. Head on over to this page and get yourself setup with the latest cut of IronPython. Once that’s setup, you should have all the fancy tools you need! I’m sure you feel the excitement building. I’ll start by saying the code is all available online, so even though I’ll have snippets and pictures here, you can download all of the source and follow along that way if you want. Otherwise, I’ll do my best to walk you through how I set things up! This application is going to be pretty simple. It’s a tiny bit bigger than a “Hello World” application, with the difference being that you tell Python what you want to print to the console. Easy-peasy, right? First up, let’s make a new C# console project. From Visual Studio, go to the “File” menu at the top of the IDE. Select the “New” menu item. Select the “Project” menu item. You should see the “New Project” dialog. 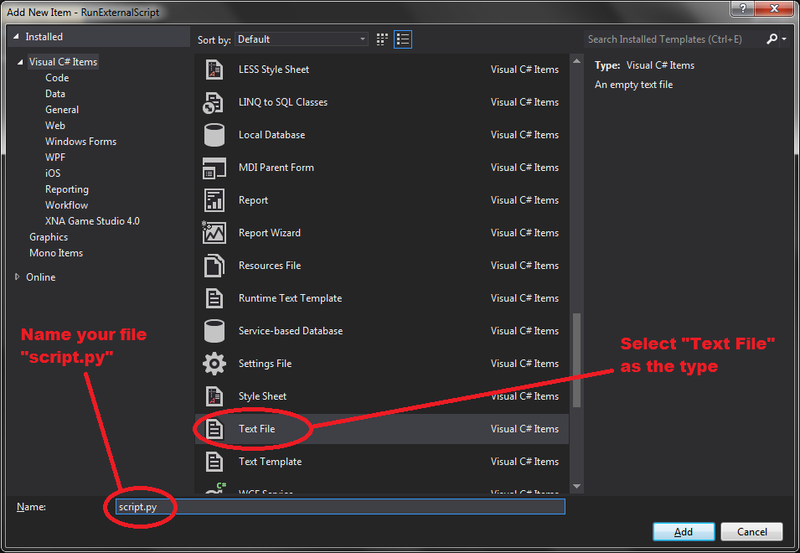 Select the “Visual C#” template on the left of the dialog. Fill in the details for where you want to save your project. Press “OK”! And we’re off! 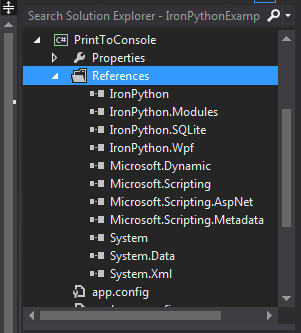 Add the IronPython and Microsoft.Scripting dependencies through the solution explorer in Visual Studio. First, we’re getting input from the user. This is some pretty basic C# stuff, but we’re simply printing a message to the console and taking in the text the user enters before they press enter. Next, we create a Python engine instance. This is the class that’s going to be responsible for executing python for us! The code that exists within the try block tells our engine instance to execute some python code. The print() method that you see being passed to the engine is the syntax since Python 3.0. The parameter that we’re passing into the print() method is a Python string… but we’re sticking our user input inside of it as well! It’s also important to note that we’re building up a C# string that contains all of the Python code that will be executed and passing that to the engine. I have a catch block here to catch any unexpected problems. Can you think of any? What happens if your user inputs some text with a single quote? The last part of the application just asks the user to press enter when they are all done. Simple! There’s your first C# + Python application! You can see the source for the whole thing over here. This script looks similar, right? Before I explain what it does, let’s add in the Python script that you’ll be executing from this console application. Right click on your project in the solution explorer. Select the “Add” menu item from the context menu. Select the “New Item…” menu item. You should see the “Add New Item” dialog. You’ll want to add a new text file called “script.py”. In the “Add New Item” dialog, select “Text File” and rename it to “script.py”. Okay, so back to the C# code now. This example looks much like the first example. Wait for the user to press enter before executing the Python script. Just to make sure they’re ready! Create our engine instance, just like in the first example. In the try block, we tell the engine to execute our script file. Because we had the file copy to the output directory, we can just use a relative path to the file here. Again, we’ve wrapped the whole thing inside of a try/catch to ensure any mistakes you have in your Python script get caught. Try putting some erroneous Python code in the script file and running. What happens? Finally, make sure the user is content with the output and wait for them to press Enter before exiting. Look how easy that was! Now you can choose to execute Python code generated in C# OR execute external Python scripts! It’s awesome to see that you expressed an interest in trying to marry these two languages together inside of a powerful IDE. We’re only breaking through the surface here, and admittedly I’m still quite new to integrating Python and C# together. I need to re-familiarize myself with Python, but I can already see there is a ton of potential for writing some really cool applications this way. In the near future, I’ll be discussing how the dynamic keyword in C# can actually allow you to create classes in Python and use them right inside of C#… Dynamically! The post Python, Visual Studio, and C#… So. Sweet. appeared first on Dev Leader. 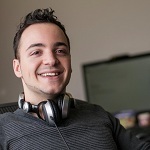 I graduated from the University of Waterloo for Computer Engineering and I'm fortunate enough to work as a Team Lead of Software Engineering at Magnet Forensics. As a team lead, I'm often looking to encourage better coding standards, creative approaches to problem solving, and ensure that good clean code makes it into the code base. I want my team to produce top-notch code, but I want to make sure that we're all learning to become better developers along the way. Is this convert Python code to C# code too? First thanks for these great article. I need to convert my python code to C# but I think that "iron python" can just change C# code to Python. is this true, can you guide me how to change my python codes? Python Script consisting of nltk packages. It is giving an error like 'No module named nltk.coprus'. What should be done? Please, help me! A well written intro to marrying C# and Python. Thank you. Once we downloaded iron python,but when i tried to run python method it throws me error. For instance requests, or urlib and many other. Can u tell me how to install pip and this types of lib in ironpython ? I've used PyQt and PyQtGraph to do some real-time graphing, but I think the .net platform (with all cool .net widgets that people share) might even be better for my application! But for developers, is the main point of IronPython the idea that you can make c# applications that can utilize python scripts? And not so much the other way around? Also any idea if Python 3.4 is being planned for IronPython? Great question, and to be completely honest, I'm not entirely sure. My initial understanding is that you leverage it in .NET to allow access to Python. The second one might give you some insight as to how you could create some sort of context in Python, use the dynamic keyword to create an instance of it in C#, and then feed back other data. Could be some interesting opportunities there. As far as Python 3+ is concerned, from the IronPython websites it doesn't look like it (from a glance). I'm personally not an active Python developer, so I'm not totally sure why the big fuss with 2.X vs 3.X. 1. Pass an input string to a python function/method. 2. Obtain the results returned from the script method. I wonder how do you debug a python script from within C# project? If you're trying to debug C# code and Python at the same time, it can get tricky. I'm not claiming to be an expert here by any means either. You could choose the IronPython debugger, which according to that link, "The IronPython launcher uses the .NET debugger, which only works with IronPython but allows for stepping between any .NET language project, including C# and VB. If you attach to a running .NET process that is hosting IronPython, this mode is used". I'm pretty sure you can also use another debugger to attach to a Python process once your C# code has started invoking some Python. I hope that's at least a good starting point. This example is great! Do you have an example on how to run a python script from a Windows application as opposed to console application and how the output from the script is redirected to a windows control (text box, view grid)? 1) Be able to type a script in a text box and then run it? 2) Be able to press a button that runs a script and see the output within the form? My idea is more like option 2. I have a collection of python scripts from where I want to be able to select one and execute it with a click of a button. The output of the script needs to be redirected to a variable or array so I can format the output and display it on a text box or table within the windows form. I hope that is possible. I'll try to get something mocked up and posted over the weekend. Busy with work and such, but I'd like to be able to get that for you. I think the biggest problem of a windows form application that runs python scripts is to capture the script’s output. I can’t find a way to capture the output of an executed python script.